​Mumbai,: ​ Universal Pictures India will be releasing the epic adventure movie Warcraft on 10th June, 2016. Directed by Duncan Jones (Moon, Source Code), Warcraft is based on one of the most popular game series by Blizzard Entertainment. The film stars Travis Fimmel (TV’s Vikings), Paula Patton(Mission: Impossible—Ghost Protocol), Ben Foster(Lone Survivor), Dominic Cooper(TV’s Preacher), Toby Kebbell(Dawn of the Planet of the Apes), Ben Schnetzer(Pride), Robert Kazinsky(Pacific Rim), Daniel Wu(TV’s Badlands), Ruth Negga(World War Z), Anna Galvin(TV’s Legends of Tomorrow) and Clancy Brown. The film will be releasing in India theatres, Real 3D and IMAX 3D in June 2016. 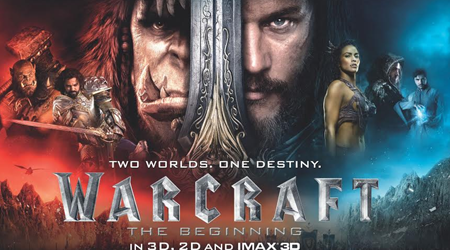 ​ Warcraft will be releasing in Hindi, English, Tamil, Telugu across India. About the game: Warcraft: Orcs and Humans, created by Blizzard Entertainment in 1994, was a breakthrough smash success that served as the first chapter in a trilogy that, for many fans, redefined the real-time strategy genre. The second and third, Warcraft II: Tides of Darkness and Warcraft III: Reign of Chaos, further stoked fascination and imagination in its players, as did the best-selling novels and other popular merchandise. But it was the fourth title in the series, World of Warcraft, that was, literally, the game changer. Today, World of Warcraft boasts 100 million registered users, maintaining its ranking in the top-10 most popular MMORPGs (Massively multiplayer online role-playing game) in the world.